Bazinga is a typical german gambling machine like you can see in german pubs. Beat the House is a poker simulator. 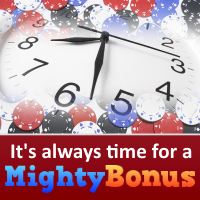 Before each hand the player can select the amount of money to bet. Then the game begins by pressing DEAL. The computer provides the player with 5 random generated cards and the player has the possibility to hold or discard each of the cards. By pressing DEAL agai.. The goal of the game is to make the open ends of the layout add up to 3 (or a multiple of 3 (3, 6, 9, 12, 15, 18, etc.). You can draw 10 times (or more) and at any time 1-7 tiles to make up your hand. The first double (1-1, 2-2, ..., 6-6) is known as the spinner. To this spinner next tile can be add..
Lucky Pandas is a FREE slot machine set in a bamboo forest full of cute pandas, cherry blossoms, and shrines. In the Bamboo Bonus Round rub the bellies of cute pandas to reveal your prize. The soothing soundtrack will hypnotize your senses while you are entertained. Symbols: Cherry Blossoms, Yin Ya..